in Rees Cyclopaedia 37:63, 1817. Type: ‘west coast of North America’, collected by Archibald Menzies. Holmgren: section Rostellatae Boiss, subsection Rosulantes Borbas. According to Clausen (1964), the subsection Rosulantes includes V. adunca and V. howellii, all with base chromosome number of x = 10. See Abrams L. R. & R.S. Ferris. An Illustrated Flora of the Pacific States: Geraniaceae to Scropulariaceae, Vol. 3. 1951. Stanford University Press. Leaf margin pubescence does not seem to be a reliable characteristic to differentiate between adunca (+/-), adunca minor (conspersa VF -, others not recorded) and labradorica (-). Leaf shape especially distal end (tip) and leaf bases seem more reliable. TM, 2009: Kevin discovered that the occurrence of papillae in the Rostratae was unstable and varied from flower to flower, and I think some of your drawings of Chamaemelanium showed the same; maybe this is a character to omit (and state so in the figure head). In Arizona. RHS 88A or bluer in CA, OR, WA. Leaves rounded to acutish at the base; stems stout, thick, caespitose, leaves glabrous or nearly so, to puberulent. Plants evergreen, do not die down for winter. In BC, Canada. For plant details see e-Flora BC website. GRAHAM ISLAND: 2n = 20, 1 1/2 mi S of Jungle Beach, CST23460. The same chromosome number, n=10 or 2n = 20, was obtained on material of this species from California, Nevada, Oregon, Idaho, Colorado and Vancouver Island, British Columbia, by Gershoy (1934) and Clausen et al. (1940). It is interesting to note that plants with the chromosome number n = 20 or 2n = 40 occur in Alberta and Manitoba (Packer 1964, and Taylor and Brockman 1966). Listed as occurring in Crater Lake National Park, Oregon. Flowers purple with white centres, about 1/2” across; long-spurred at the back. Leaves basal, more or less rounded 1/4-3/4” across, on 1-2” petioles; margins lightly toothed, peduncles 1-3”tall. Grows in small clumps at all but the highest elevations in the park. Requires a relatively moist soil, blooming from June to mid-July in the park. p 199*V. adunca collected Wenatchee Mtns, WA, Old Bluett Pass Road, south end, c. 1 mile in, semi-shade, with V. nutallii. Good rich soil. Very low, small plant, flowers equal to leaves in height or a bit below. Plant height at flowering 4-4.5 cm high. Flowers lilac blue, some paler (older?). Petal spur long relative to flower size. Stems not elongated at flowering so does not look caulescent, stems multiple, purple, very short at flowering, and partly below ground. Spur held vertically, stipules adnate, colourless to pale green, some plus purple. Petioles pale green to purple, especially towards base. Leaves with some hairs on upper surface, towards outer margin, margin lightly purple, glabrous, lower surface some hairs on veins and lamina, petiole and stipules glabrous. Peduncle 5 cm long, spur 0.4 cm, pale purple, paler than blue-purple flower, but also redder, glabrous. Bracts tapered, thin, green plus purple, 0.4 cm, not opposite, 2/10 (=1/5) down; flower 1.0 cm wide x 1.2 cm, auricles plus sepals 0.6 cm, green plus purple, sepals with hyaline margins, all glabrous. Blue-purple guidelines on all petals, on spurred lowest petal on white background, on all others on blue background so not as noticeable. Guidelines on lowest petal run length of petal. Large white signal on spurred petal. Lateral and top petals narrow, keel 2 x as wide. Ovary plus style 0.4 cm high; ovary green, glabrous; style colourless, projections back, and sides of style head, end of style hooked. p C79, V. adunca Wood Camp, Logan Canyon, I 89, Cache County, limestone rocks, under small trees of Acer grandidentatum. Flowers variable in colour, RHS 92C and paler in some, spur colourless also variable from almost white to mauve (redder than petals, and darker. Stipules NOT adnate on cauline petioles, basal leaf stipules adnate to petiole 1/3-1/2 of their length, flowers 1.8 wide x 1.6 cm long, pale blue-mauve, large white signal patch at base of keel petal, guidelines dark blue; hairs on lateral petals dense, straight. Head of style with obvious hairs. White base of all petals, reverse of petals paler mauve. Not all flowers are as wide, lowest petal concave, end curved upwards, end truncate. Leaves pointed with shallow cordate bases. Leaf shape very variable, round-tipped ovate cauline leaves as on p. C53, next to pointed cauline leaves as pictured here. Leaf shape and leaf tip are not reliable characteristics in this population. This is not usual for V. adunca where leaves are usually very uniform shape and size. Plants very variable in this colony, those in sunnier more exposed site have narrower leaves , some flowers wide rounded, some narrow and long like V. conspersa with two top petals pointing up and three lower petals narrowly together and pointing down. 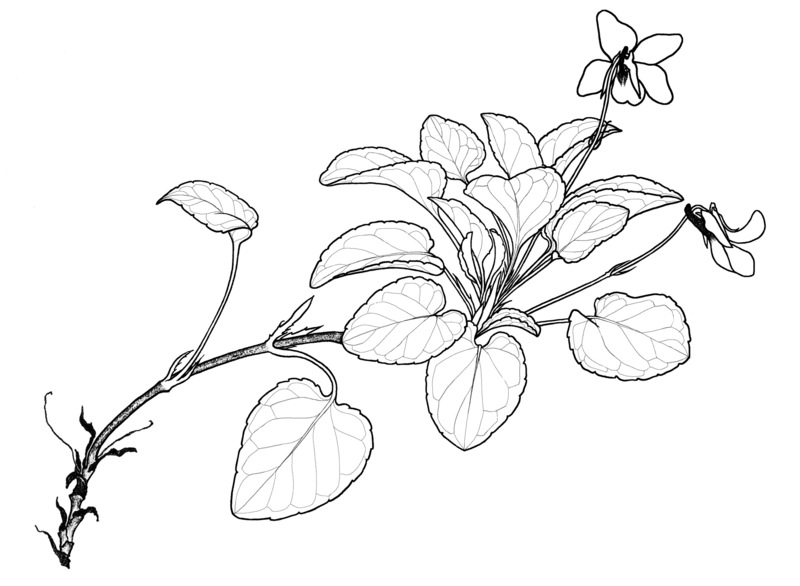 Plants in more sun are more upright, like conspersa, but petals narrow. Some elongated stems but most not elongated at flowering. p C87, Cottonwood Canyon, a tributary of Logan Canyon, Cache County, Wasatch/Cache National Forest, Utah, June 24, 1990: Caulescent perennial, very fine peduncles and petioles, very short stems, leaves green, thin. Many branches from root. Not typical V. adunca with very pale or white spurs and very thin leaves. I saw several more populations of this with a white spur, including up Temple Fork, tributary of Logan River, in Logan Canyon, approx. e miles SE of intersection of Temple Fork Road and I 89. Spur same length, stems more elongated. Upper leaf surface covered with very short hairs, veins also and margins, lamina green. Lower surface with few hairs on lamina, more on veins, all very short, lamina pale green. Petiole green with little purple at base, lamina decurrent for top half of length but rolled inwards on abaxial side, very short pubescence. Stems narrow/fine, purple, with few scattered fine hairs. Stipules scarious, persistent, brown, adnate, with glandular-tipped fimbriae, 0.85 cm. Peduncle glabrous, green, long very narrow/fine, axillary, little purple at top. Bracteoles c. middle of peduncle, green, 0.4 cm, glabrous, no fimbriae. Leaf margins evenly crenate. Sepals green plus little purple, glabrous, gradually tapered to fine point, 0.55 cm. Auricles green, glabrous, uneven in length and width, longest 0.15 cm, sepal plus auricles 0.7 cm. Leaves not folded down middle, much wider than those from west coast, thinner, pubescence shorter and, therefore, less obvious. Spur of these flowers were pale/white, cf. those from Wyoming and west where spur is always darker and pinker than mauve flowers, also spur usually tubular, there were flat. Not a typical adunca. June 4, 2008: Viola adunca photographed in front of the Crystal Basin Information (Ranger) Station on Ice House Road, north of Highway 50, east of Placerville, El Dorado County, California. Trees growing around the Ranger station are Redwood (Sequoia sempervirens), Jeffrey Pine (Pinus jefferyi), Douglas Fir (Pseudotsuga menziesii), Ponderosa pines (Pinus ponderosa), Red Fir (Abies magnifica), White Fir (Abies concolor), Sugar Pine (Pinus lambertiana) and Incense Cedar (Libocedrus decurrens). Altitude 1520m, N 38º 50’ 44”, E -120º 22’ 23”, 8.5 km north of Route 50. Very sandy soil. 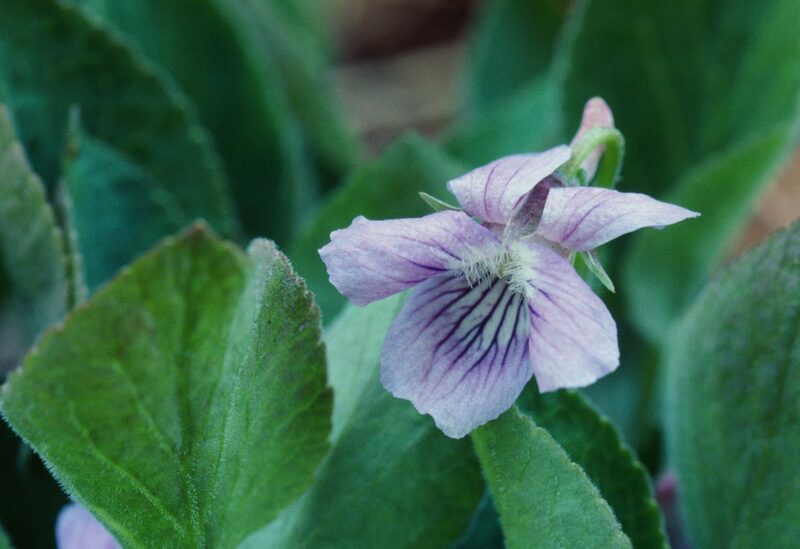 Also growing in the same area were Viola lobata and Viola bakeri. Viola adunca was just beginning to flower when the other two species had been flowering for at least a week or more. V. adunca photographed and drawn, Donner Pass area, 5 June 2008, alt. 1850m., Nevada County, California: Basal leaf stipules are adnate to petiole for half of length. Cauline leaves narrowly winged for whole of petiole (or, leaf margins decurrent for whole length of petiole). p 82:m Some purple on back of leaves, growing in very wet seep, in full shade, stems green plus purple, leaf petioles to 7 cm, plus leaf = 11 cm. Flowers and plant larger than all books say. Ovary plus style 5.5 mm, ovary green, glabrous, purple line down front of style, style head papillose, petal spur red-purple, flower blue-purple, style pale lime with purple on style head at top. spur usually redder purple, 2 top petals upright, recurved so they are standing back to back, looking like rabbit ears, central white eye, obvious long, fine hairs on the inside of the lateral petals, to lateral petals recurved and pointing downwards, end of lowest petal rounded. See good photo in website of calphotos.berkley.edu. Jepson on-line: V. adunca Sm. Chromosomes: n=10 [adunca var. minor has n=20]. Distribution outside California: to Alaska, Colorado, e N.America. Also in Arizona: V., affinis?? What is this really? Type Information: Collector Jack Kirk, Collection Date (as Text) 30 Jun 1964, type location (in GCI) holotype CAS 460888 460888 V. adunca var. kirkii is a very small, compact form of V. adunca, flowers white with dark purple spur, pods green, seeds dark brown, 1.9 x 1.0 mm. Does not like the extremely cold winters in PHL, likely to die out, also with heat and humidity. In early spring the leaves are very purple. V. adunca var. adunca is also purple in early spring, but not quite as much as V. a. var. kirkii. 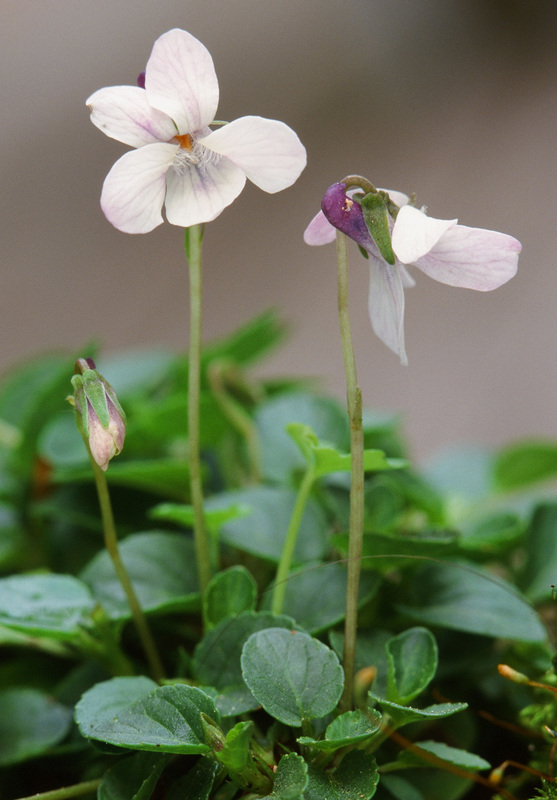 p B22, Viola adunca var. kirkii Duran: Very small leaves, very low prostrate plant, caulescent, prostrate stems rooting from nodes occasionally. Flowers white, mauve tinge on outer edges of petals, inside surface, pale mauve on outside of the two top petals and a little on laterals, lowest petal white outside at tip, but all petals outside have blue-purple spots towards centre of petal , same colour as dark purple spur. Long spur, half as long as flower plus spur. Flower 1.2 x 1.2 cm, no perfume. Flowers well above leaves, lowest petal shorter than downward pointing laterals, lowest petal wide, notched at tip (emarginate), long straight hairs n inside lateral petals, few hairs on top petal, no purple guidelines but purple colour in throat on all petals; sepals and auricles green plus little purple, glabrous, 0.5 cm, sepals slowly tapered (attenuate), hyaline margins, auricles well separated from peduncle. Peduncle green plus purple spots at top bend, glabrous. Bracteole 0.35 cm, green, glabrous, Spur very thin in section. Stems horizontal to inclined, prostrate with rosette of leaves growing at the tip of the stem, these leaves are densely concentrated, ie exceedingly short internodes; on lower stem, auline leaves. Stipules adnate to basal petiole for half stipule length, leaves shallowly cordate to truncate at base, stipules with glandular-tipped fimbriae, grren, glabrous. Many stems per plant, radiating from central rhizome, stems not rooting at nodes. Leaves glabrous. Ovary plus style 0.35 cm, ovary green, glabrous, style colourless, style head papillose on top and sides, very short hook forming stigmatic opening. p D138, Notes on var. kirkii ex Plant World: plant height 4 cms, caulescent, compact clump, multi-stemmed from rhizome crown, basal leaves with longest petiole, cauline petioles short. Cleistogamous pod green, glabrous, 0.5 cm long, sepals and auricles green, glabrous, 0.55 cm, auricles flaring away from peduncle, sepals with hyaline margins, peduncle green plus purple, glabrous. Bracteoles green, glabrous, 0.35 cm, 1/2 down. Many stems, basal leaf rosette; older lateral stems horizontal with leaves concentrated near tip, tip of stem turns upwards. On plant two years old, longest (oldest) stems are 4.5 cm long; stems branchng. Little red spider damage but not nearly as bad as most. Newer central stems closer to vertical. Leaf glabrous, green, paler under surface; petiole glabrous, green with little pink-purple at base; stipules green, glabrous with glandular-tipped fimbriae on margin, adnate to petiole, 0.9 cm long, free part 0.5-0.6 cm. Leaf margin decurrent on petiole (petiole winged). Internodes very short, less than 0.4 cm, usually about 0.1 cm, leaves clustered at tips of stems. According to Clausen (1964), the subsection Rosulantes includes V. adunca and V. howellii, all with base chromosome number of x = 10. Wide distribution in California, in most counties, especially all counties bordering Nevada, see maps at http://www.calflora.org. Flowers violet to blue. Common entire w. slope, damp places. Mixed coniferous forest and foothill woodlands. 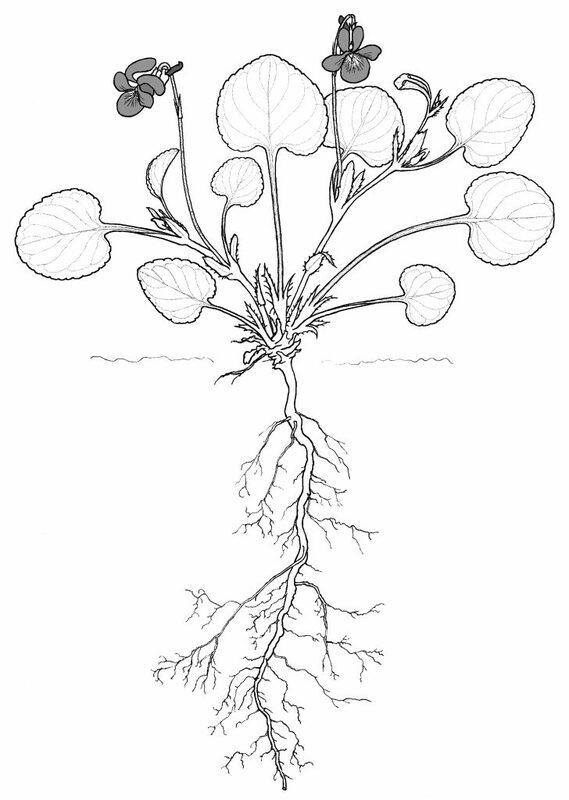 Nelson, R.A. Handbook of Rocky Mountain Plants. 1969. Dale Stuart King, Tucson, Arizona: V. adunca var. bellidifolia. The subalpine and alpine forms of this plant are quite compact with short stems, small roundish-ovate leaves and comparatively huge blue-violet flowers. This is frequently found along streams, at edges of subalpine meadows and on moist slopes above timberline where it is seen in bloom during the summer. The species , V. adunca, grows taller with a definitely leafy stem and occurs throughout the Rockies from moist foothill ravines to timberline. 1a. Flowers yellow; petals may be purple-tinged on back. 1b. At least some of the leaves deeply or shallowly lobed or toothed. * Reference says V. pallens but this is incorrect. SFO Wildflowers CD: prostrate, mat forming but prostrate stems not rooting at nodes, coastal meadows or the edge of coastal forests, chimney Rock (Point Reyes National Seashore, San Bruno and Montara Mountains. Viola adunca Sm. var. cascadensis (M.S. Baker) C.L. Hitchc. Viola adunca Sm. var. uncinulata (Greene) C.L. Hitchc. Distribution: AZ, CA, CO, ID, MA, ME, MI, MN, MT, ND, NH, NM, NV, NY, OR, SD, UT, VT, WA, WI, WY. Viola adunca Sm. var. kirkii Duran occurs in California only, endangered. Viola adunca Sm. var. oxyceras (S. Wats.) S. Wats. ex Jepson, in California and Nevada only, endangered. www.wnps.org website: Moist meadows, open woods, and grasslands from lowlands to subalpine elevations, in Western Washington grasslands and oak woodlands; throughout Cascade Mountains, but more common east of Cascade Crest, flowering April through June (depending on elevation). Notes, p. 117 & 8, V. adunca var. ? (minor or bellidifolia), Keystone, Summit County, June 12, 1994: dry, in shade under sagebush, 9500- 10,000 ft. Caulescent perennial, plants up to 5 cm high, forming dense clumps, leaves longer than wide, flowers above leaves, basal leaves with stipules adnate about one third of length, Leaves pubescent, purple on underside, very dense short hairs all over top surface, lower surface, veins and margins. Stipules 1.1 cm long, 0.8 cm free, rest adnate to base of petiole, some short glandular-tipped fimbriae n margin, also fine cilia around margin. Petioles and peduncles pubescent. Peduncles purple + green, bracteoles purple + green, more purple than peduncle, 1/3 – 1/2 down, with few very short glandular-tipped fimbriae at base. Flowers blue-mauve with hairs on inside of lateral petals only, none on keel petal though Dr. Dee Strickler “Forest Wildflowers” says V. adunca has hairs on lower 3 petals) , hairs colourless, dense, long, simple, no perfume; petal spur narrow, hooked upwards at tip, spur pink-purple, pinker than rest of flower, 0.45 cm long. Sepals and auricles purple, not appressed, but held close, both purple also peduncle at top, very fine hairs around margin of sepals, auricles glabrous; ovary plus style 0.4 cm high, overy green, glabrous, style pale green. Pubescence on top, back and sides of style head. Mike Slater re Alaska: V. adunca had more open flowers with the top petals quite separated from the lower ones [like rabbits ears]. The ones I studied and photographed had very narrow spurs, which were hooked as described in the Flora of Alaska. They were at the bottom of the mountain in the mostly cottonwood forest. I will attach some photos to this e-mail. I think Mike gave me a slide, or offered to lend it to me to scan. Seeds of V. adunca , Del Norte County, n.CA, dark grey. Doretta Klaber says V. adunca grows in dry places, but many of mine were collected in places which were quite wet, especially in the spring, for example, beside a creek at the Donner Pass, California. Many are in areas of winter snow cover, which always gives high amount of moisture in the spring thaw. Later in the year, these areas can be very dry. In many cases the plants I saw were growing under some sort of cover, often tucked under small bushes, for example, under sagebrush. 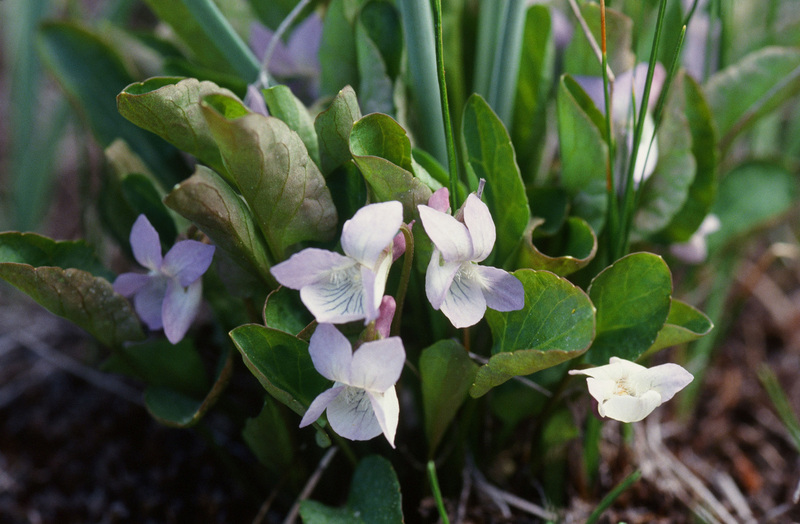 Verna Pratt says it grows in dry, rocky places and blooms in late May to early June in Alaska, very short-stemmed small dark green leaves, numerous short-stemmed purple flowers. V. adunca in NE Utah (growing on limestone or was it dolomite – Ca + Mg) was different from the V. adunca I have seen in the west of north America, but we saw typical V. adunca in Wyoming at the working farm on which we stayed, and this is SE of the site in Logan Canyon. The V. aduncas had more open flowers with the top petals quite separated from the lower ones. [Oops, this is how I describe V. conspersa flowers.] The ones I studied and photographed had very narrow spurs, which were hooked as described in the Flora of Alaska. They were at the bottom of the mountain in the mostly cottonwood forest. The color was a deep, rich purple often with a darker center. Perennial, to 5” high, in clumps, with slender, leafy, erect to inclined stems. Flowers to ¾” long. Common in meadows, aspen groves and forest glades, along roads and around springs and streams, montane to alpine (8,000-14,400 ft), flowering April to August. Oregon, Cow Creek Loop Road, just west of Riddle: Plant height at flowering 10 cm, max leaf length 4.3 cm, max leaf width 3.3 cm at flowering, hairs on leaf margin, upper surface glabrous, few very small, short hairs on lower leaf surface and veins, petiole length at flowering 7 cm, glabrous; stipules 1.5 cm long, adnate, margin with short glandular-tipped fimbriae. Peduncle length 14.5 cm, bracteoles narrow, 1/4 – 1/2 down, 0.6 cm long. Flowers above leaves, axillary, colour 88A and 89C in centre, 2.4 cm x 2.3 cm wide, no perfume, hairs on lateral petals thin, tapered, long; spur colour pink-purple. Flowering May. Oregon, road 4650 in swamp meadow, 4 miles off road 46, Williamson Rive Road, c. 29 miles ENE of Chiloquin, in Winema National Forest, Klamath County, very rich soil: New leaves have lobes curled in, most laves folded along midrib, gland at tip (distal end of leaf), flowers pale mauve. Ovary plus style 0.3 cm high, ovary green, glabrous, style colourless, head papillose, purple line down front of style, spur of adunca is always red-purple, but flower blue-purple or mauve or pale blue, bracteoles 0.25 cm long, peduncle green plus purple, more purple below bracts to base and where peduncle joins sepals, auricles purple, sepals green plus purple with purple central vein. Leaves pointed, tapered to end (attenuate), purple tinge on leaf edge especially towards tip, 1.5 cm long x 0.8 cm wide towards base, ovate to triangular, base cordate, margin crenate, stipules adnate, purple tinge n back of leaf. Plant height in summer 4 cm, other plants with leaves, 2.0 cm long x 1.6 cm wide, and some older leaves 2.1 x 2.0 cm. Cascades, Oregon: Caulescent perennial. Plant height at flowering 7 cm, petioles and leaves glabrous, paler, purple under side of leaves; leaf 2.7 cm long x 1.9 cm wide, leaves folded inwards along mid-rib, petiole 5.0 cm; stipule 0.6 cm, toothed, adnate; peduncle 6 cm long, bracteole 1/2 down; flower photo 1:1, colour 97A-B, pale mauve, spur 0.4 cm long, purple, hooked at end, auricles plus sepals 0.45 cm. 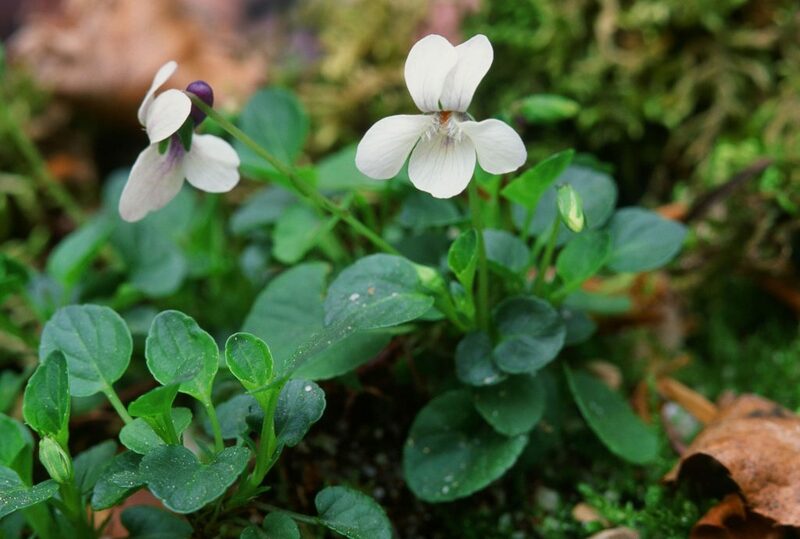 Vancouver Island, see collected by Adolf Ceska: Unusual petal colour pattern and slightly larger plant than usual. Caulescent perennial. Leaf margins decurrent the length of the petiole. Basal leaf pubescent all over, leaf top and veins densely covered with short hairs, petioles finely pubescent on the decurrent magins and margin often curled inwards, basal leaf stipules adnate for half of their length to the petiole; upper cauline leaf all pubescent, short fine cilia on surfaces, veins and margins, margins decurrent leaf base truncate; cauline stipule adnate but only lowest one quarter, stipules green, ciliate on margins, also with glandular-tipped fimbriae usually short fimbriae, base truncate to attenuate. Flower size 2.1 x 2.1 cm, Upper 2 petals overlapping, recurved in older flowers, wide petals twisted. Lowest petal long, notched (emarginate) at end. RHS 89 D with darker patches in centre upper petals and laterals 89 B-C, purple striations/guidelines on all petals but more obvious on lowest petal, full length. Jairs on inside of lateral petals long, thin, dense, tapered to tip. Sepals plus auricles 0.7 cm, green plus little purple, glabrous. Sepals tapered, hyaline margins, auricles unevenin size, parallel to peduncle but not close. Spur dark, pink-purple, 82 A, redder than petals. Ovary plus style 0.5 cm long, ovary green, glabrous, style head pappilose, light green, style light mauve with dark stripe down the middle on abaxial surface. Seed pod green, glabrous, seeds mid-brown, 2.0 x 1.4 mm. In fact, in Viola the 2n=20 chromosome number is tetraploid, not diploid. The genomic duplication is evident for all enzyme systems -and species- that I have investigated (see Marcussen & Borgen 2000). True diploids having 2n=10 are not known from section Viola, and 2n=20 is therefore the basic chromosome number of this section. For the genus as a whole, the basic (and most primitive) number is 2n=12 (diploid), as seen in several of the yellow-flowered species, e.g. Vv. biflora, uniflora, pubescens. Section Viola may have arisen from groups having this number by the loss of one pair of chromosomes, followed by alloploidy (2n=12 -> 2n=10 -> 2n=20). The striking absence of species having 2n=10 (or 30) suggests that this intermediate evolutionary stage was of a very limited temporal and geographical extent, and that all taxa representing it are now extinct (or not yet discovered). Most of the groups in section Viola have retained 2n=20 or multiples thereof as basic numbers. I suspect that the aberrant aneuploid number 2n=54, seen in subsections Boreali-Americanae and Pedatae, may have been derived from 2n=20 by a secondary loss of one chromosome pair and polyploidy. If this theory is correct, 2n=54 is a 12-ploid number. This can be tested using enzyme electrophoresis or DNA seqencing. Here is what I have been able to dig up regarding V. adunca and its relatives: It seems now that the 2n=40 morph should be referred to as V. aduncoides. This species was diagnosed by Löve & Löve (1975: Bot. 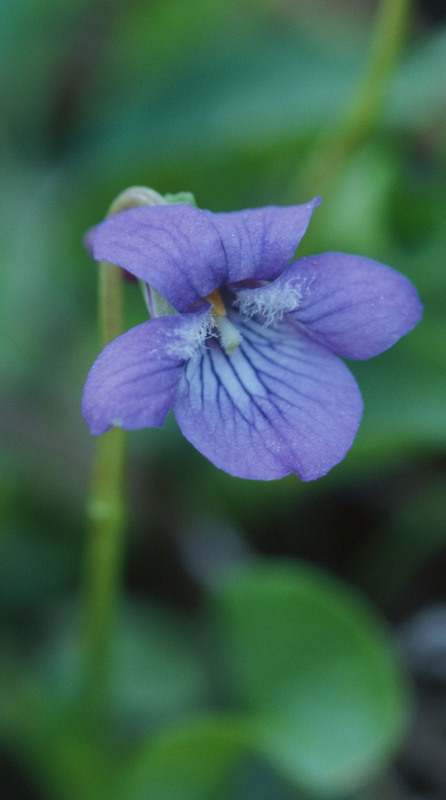 Notiser 128(4): 516), partly based on a study by McPherson & Packer (1974: A contribution to the taxonomy of Viola adunca. Can. J. Bot. 52: 895-902). Gershoy (1934: Studies in North American violets III. Chromosome numbers and species characters. Vermont Agricultural Experiment Station, Bulletin 367: 1-91) showed that the hybrids V. conspersa x rostrata and V. rostrata x striata were fertile. These three species therefore form a natural group, although they are morphologically quite different. 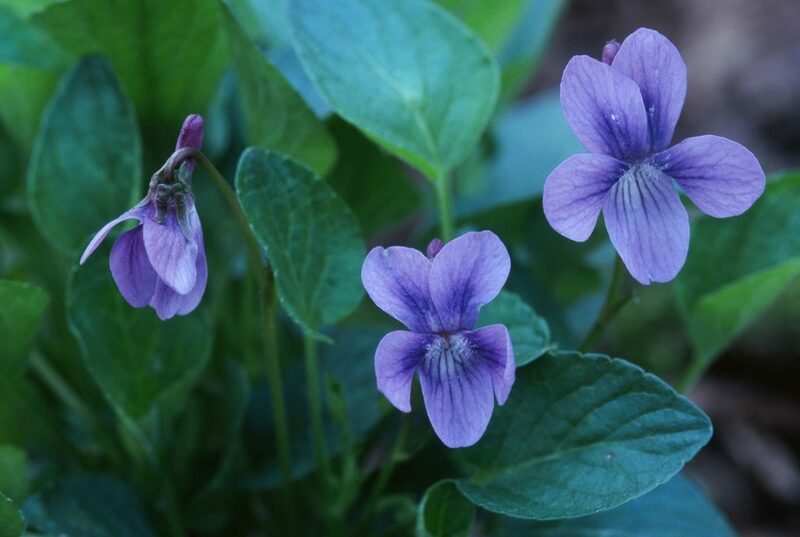 A later study by Harvey (1966: Cytotaxonomic relationships between the European and North American rostrate violets) showed that V. adunca, V. rupestris and V. labradorica form a natural group. Their hybrids were, however, sterile (adunca x labradorica was not investigated). Some genetic distance between the adunca group and the conspersa group was also suggested by the fact that V. rostrata x rupestris did not develop normally and never flowered. To sum it up, none of the thorough studies above give any clue to why certain authors choose to include V. conspersa in V. adunca. I am not an expert of this particular group, but my impression is that it is a nomenclatorial problem rather than a biological one: Names may have been given different meanings by different authors, and often it feels better to lump species together if you don’t know exactly how they differ (or if at all). It is true that the delimitation of species is difficult when hybrids (although sterile) are common and when the species are variable. 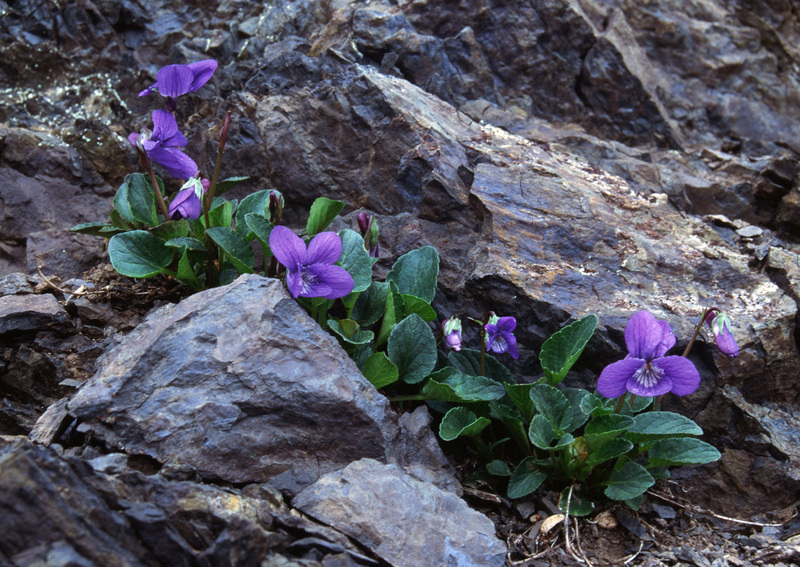 In violets, this variability often has a geographical (local or regional) as well as an ecological component, and this does not make it easier to distinguish among species. 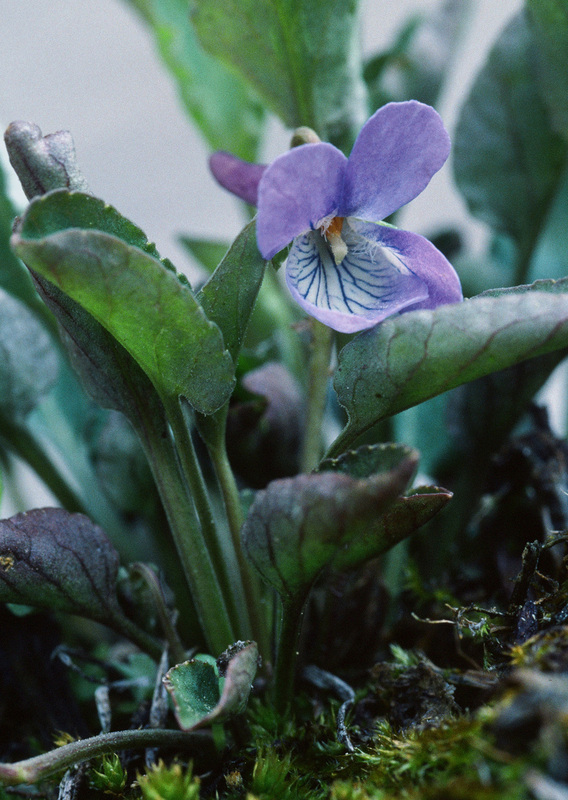 Viola adunca Smith var. glabra Brainerd, Rhodora 15: 109, 1913. Type: one of the stations cited in “gravelly beach”, Carlton, Bonaventura Co., Quebec, July 19, 1905, collected by Collins and Fernald. Viola bellidifolia Greene, Pitt. 4: 292, 1901. Type: “mossy bog in Slide Rock Canyon, west of Hesperus, Colorado, July 2, 1908, collected by Baker, Earle and Tracy. From Zurich herbarium: V. bellidifolia Greene, alpestrine, granitic source of West Eagle, Wallowa Mtns, E. Oregon, 2330m, very short compact plants, leaves 1-1.5 cm, petioles up to 4 cm, plants to 5 cm. Flowers just above leaves. Love & Love say glabrous or shortly pubescent. Weber said that V. bellidifolia is the same as V. labradorica. V. labradorica grows on alkaline soil. NE Utah plant on limestone or dolomite. Dwarf, caulescent alpine plants with glabrous leaves and petals about 5 mm long are var. bellidifolia (Greene) Harrington. Is this correct that they are glabrous, must read original description of bellidifolia by Harrington. Viola adunca var. glabra Brainerd, Rhodora 15: 109. 1913. Type: one of the stations cited is “gravelly beach”, Carlton, Bonaventura Co., Quebec, July 19, 1905, coll. Collins & Fernald. See virtual herbarium of NYBG for distribution of specimens of V. adunca var. glabra in the Intermountain Flora section. Weber’s Rocky Mtn Flora one volume is no help with pubescence or V. labradorica. 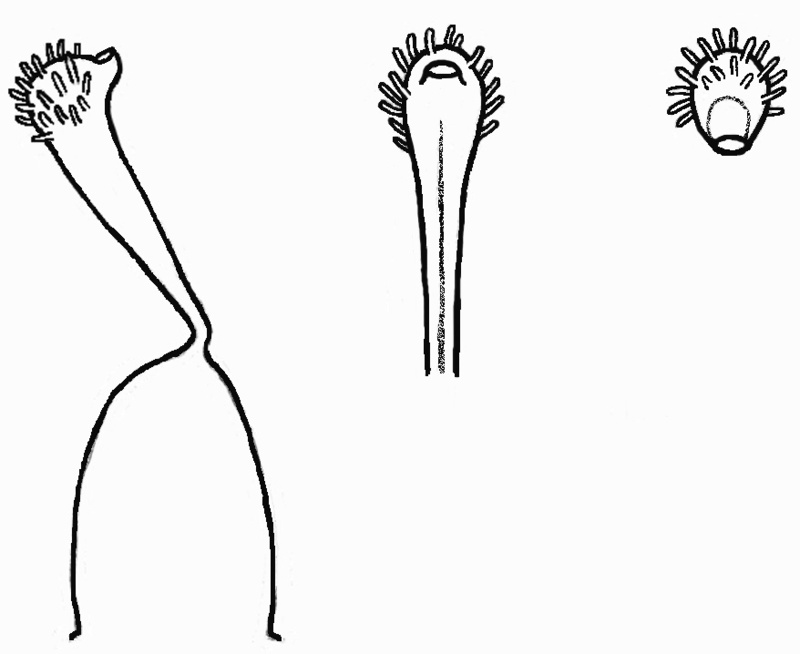 V. adunca: stipules lance-linear, bristly toothed less than half their length, leaves sub-truncate to sub-cordate at base. [specimen from Rocky Mountains, very pubescent, not one next to Jewel Lake, has teeth or glandular hairs evenly distributed along the margin of the lance-linear stipule]. V. conspersa: stipules broadly lanceolate, bristly toothed usually over half their length, leaves with +/- strong cordate base. ‘V. adunca var. minor (Hook.) Fern., more boreal or in our range, more alpine is essentially glabrous. (V. labradorica).’ This does not agree with my observations of V. adunca var. minor on Bruce Peninsula, or V. labradorica from Newfoundland. Note that I should read Harvey Ballard’s work on the pubescence of these species as mentioned in his Violets of Michigan. Reference is Ballard, H.E., Jr. 1992. 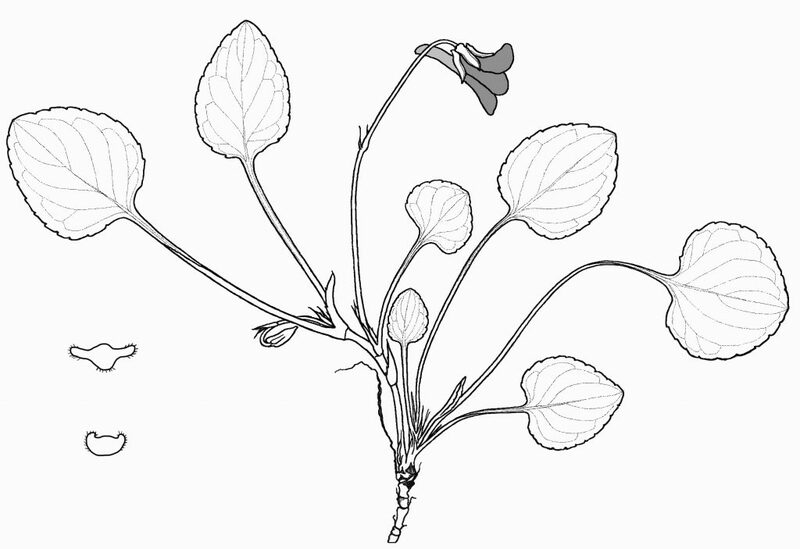 Systematics of Viola Section Viola in North America north of Mexico. M.S. Thesis, Central Michigan University, Mount Pleasant. 255 pp. [don’t seem to be able to get this reference!!]. Caulescent perennial, flowers blue or violet, plants quite small; stems short, often obscure; leaves seldom distinctly cordate. Adunca means hooked. Mountain blue violet. 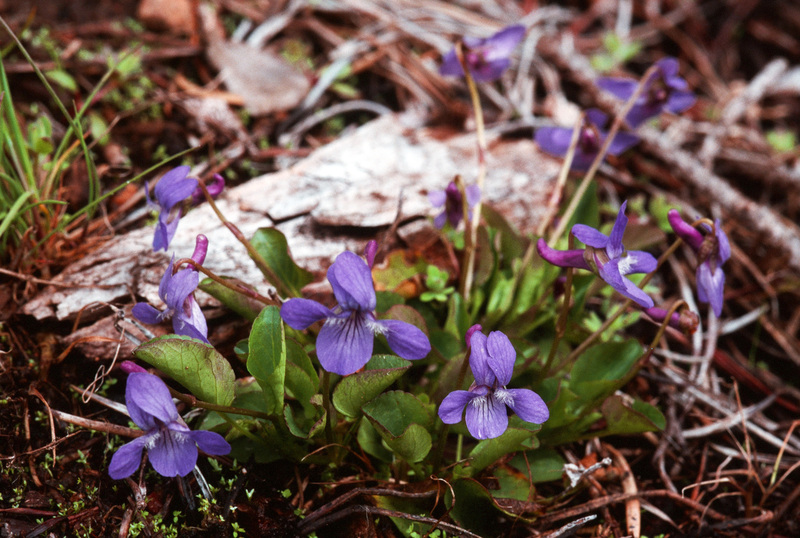 The most abundant summer-blooming violet in the montane and subalpine. The small subalpine race is ssp. bellidifolia (Greene) Harrington. Viola adunca var. minor or V. labradorica) at Loveland Pass, 11,000 ft. (above the treeline/timberline) around the top of the lake, July 13,94. Loveland Pass is on the Continental Divide, on Precambrian granite [but the pH of the water coming out of the lake is 7.5 see information in file]. Pass Lake just south of the pass occupies another glacial cirque. Huge talus cones form where rock loosened from the cliffs by freezing and thawing tumbles down ravines toward the lake. Perennial, caulescent but not always obvious at flowering, height 5 cm. Rhizome dark brown, vertical branching underground, branch rootstock producing new smaller (younger) plants. Crown producing 3 separate spreading branches, branches, ascending or vertical, very short nodes, all less than 1 cm (the longest one at the base), most too close together to measure, stems green. Leaves ovate to wide-ovate, folded down the mid-vein, typical of V. adunca, tip rounded to almost acute, base truncate, glabrous, 1.8-2.5 cm long x 1.6 cm wide, no purple coloration. Stipules slightly adnate at base, green, margins with fimbriae, 7 mm. Peduncles no purple, glabrous, to 5.5 cm, most shorter; bracts in middle, green, flaring, with few glandular-tipped fimbriae towards base. Flowers axillary, above or equal to top of leaves, RHS 88B-C, 1.5 x 1.5 cm, sepals plus auricles entire or toothed at end, truncate or acute, not adpressed, 0.5 cm; lateral petals with long, thin, dense hairs; spur purple, some slightly hooked at tip, 87 B-C, 4-6 mm; ovary pale green, style and stigma colourless except for a thin purple line down front (abaxial side?) of style at base, stigmatic head rounded, tapered into upturned beak with large stigmatic opening hole, hairs on back and top of stigma. Ovary, style and stigma 0.4 cm high. No perfume. Full sun, wet meadow, in moss around the lake and drier slopes uphill, in area of permafrost. Seeds of V. adunca ssp. bellidifolia (no, montanensis) dark brown, 1.4 x 0.7 mm. Rocky Mtns: Vail, Keystone, Loveland Pass, Mt. Sherman, Collegiate Peaks, etc. Is what I have been calling Viola adunca var. bellidifolia the same as the plant that Doretta Klaber is calling Viola montanensis? pp. 91 & 80, plate XXXVIII: ‘a softer, more pubescent plant than V. adunca, while it is a stemmed species, the stems at first are very short and hold it in a tight clump rather than spreading as in most of the aduncas’. Normally the flowers of V. montanensis are paler in color than those of V. adunca and its leaves are usually longer and narrower. Doretta Klaber’s plant was sent from South Dakota, and needed ‘more or less shade, very good soil and better than average moisture’. She includes it as a member of a complex of species closely related to V. adunca. ‘Naturally, a species that grows in such varied habitats and assumes so many forms adapts readily to many differing environments. Viola adunca collected at Rocky Mtns. Nat. Park, Glacier Canyon, below Bear Lake, and beside Jewel Lake, 9,500 ft, flowers mid-July. At the top end (SW end) of the Bierstadt lateral moraine, underlying rock is Precambrian granite. Leaves dark green, sepals rectangular, sharply acute at tip, different from conspersa, keel petal wide with tip notched. Auricles uneven in size, larger ones truncate at top, sepals adnate to 1/3 length, entire, glandular tipped cilia on margin, higher caulescent ones not so adnate; spur long, thin, 5.5 x 2.5 x 1mm (narrowly saccate). Most plants 3-5 cm high. (see photo). Flowers are not dark enough for this to be V. adunca var. glabra. RHS 88 C-D, but would have to be A like ones in WA, OR & CA. p. B 97. Ballard’s key for Michigan is not helpful here. In Rocky Mtns. there are two forms with pale flowers, one pubescent, one glabrous, both with ovate leaves with truncate bases. V. adunca coll. Ron Ratko, at Mt. Hebo, Oregon Coast Ranges, Tillamook Co., OR 3150’. Small compact tufts of oval leaves rising from a buried crown. The dark blue flowers have white beards and emerge from the tufts on very short stems. A compact form remaining less than 2” tall and rarely exceeding 3” across. Dryish meadows on exposed ridges. V. adunca var. cascadensis, seeds ex Ron Ratko, 5700ft Table Mountain, Kittitas Co. WA, large colourless aril, olive green, 2.0 x 0.9 mm, without aril 1.5 x 0.9 mm. V. adunca ssp. bellidifolia (? ), seeds collected by me at Keystone, small mid-brown, 1.7 x 0.7 mm. Growing on soil derived from Precambrian granite. Bill Weber combines V. labradorica and V. adunca ssp. bellidifolia together, and contrasts them to the lower altitude V. adunca. He says that V. adunca does not grow at really low altitudes in Colorado; as long as he knows it has not been given a sub-specific treatment. V. labradorica leaves with some short soft hairs towards the margins and on the basal lobes but not towards the end/tip, more cordate in shape, tending to fold down the middle slightly, end more pointed, narrow cauline stipules that are more uniform in width, not attenuate, 3.5-4.5 mm long, long fine glandular hairs near the base of the stipule are at least as wide as the stipule. V. adunca var. kirkii leaves glabrous, more rounded, held flatter, more rounded at the end, cauline stipules 3 mm long, adnate to the petiole for c. one quarter of its length, attenuate (gradually tapered the whole way, either entire or with glandular hairs on the margins that are more sparse but distributed along the whole margin not just the lower end, each hair wider at its base and shorter, usually much less than half the width of the stipule but occasionally as long as the width of the stipule. Montane zone, 8,000-10,000 ft. The open woods of the foothills become a tighter, more cohesive forest in the montane. The addition of lodgepole (Pinus contorta latifolia) and limber pines (Pinus flexilis) to the ponderosa pine-Douglas fir-blue spruce association (Pinus ponderosa scopulorum-Pseudotsuga menziesii-Picea pungens association), plus large aspen groves (Populus tremuloides), give the montane zone a distinct look. The montane forest supports a rich understory of grasses and wildflowers. Shrubs grow in clearings and along the forrests’ edge. At the upper elevations of this zone, white fir (Abies concolor) grows (south of Colorado Springs) and bristlecone pine, Pinus aristata (south of Berthoud Pass). The montane harbors large open areas known as mountain parks (North Park, Middle Park, South Park and the San Luis Valley) which are vast meadows of grasses and sedges dotted with wildflowers. Subalpine zone, 10,000-11,500 ft. Dense forests of Engelmann spruce (Picea engelmannii) and subalpine fir (Abies lasiocarpa) dominate the subalpine zone. These tall, stately giants form a distinctive dark green cape that drapes the shoulders of the mountain peaks. Because showers are frequent and snow is sheltered by the dense growth of trees, water is abundant and forms pools, bogs, and swamps. Undergrowth, however, is sparse and limited to the forest edges and clearings. Along rivulets and in meadows, there are luxurious carpets of wildflowers. Timberline, about 11,500 feet, is the boundary between the subalpine and alpine zones. Above this line the forests give way to tundra and trees no longer grow. Timberline (or treeline) is generally considered at 11,500 feet, although it is higher in the south (12,000 ft on Pikes Peak) and lower in the north (about 11,000 in Rocky Mountain national Park). Harsh, drying winds and cold temperatures twist bristlecone pine (Pinus aristata) and Engelmann spruce (Picea engelmannii) into stunted versions of those found at lower elevations. These misshapen trees, known as krummholz (crooked wood) are obvious indicators that you are at timberline. Alpine zone, 11,500-14,000 feet. The treeless, windswept landscape of the alpine zone is commonly called tundra. It is a high altitude environment defined by sedges and grasses. It is harsh and inhospitable. The soils of the alpine zone are thin and porous, retaining little moisture. The sun’s rays are strong, the winds fierce and relentless. Plants have adapted to this severe environment. They grow low to the ground and protect themselves from heat, cold, and desiccating wind with cuticle and hair. By growing rapidly and producing seeds early, alpine plants not only manage to survive, but to thrive. The sedges and grasses form a tight sod that anchors and holds the soil in place. Where the sedge/grass carpet is interrupted, dwarf shrubs move in and low herbs establish their own cushions and turf mats. Most alpine plants bloom in late June and early July. Roadside Geology of Colorado: Area around town of Vail (exit 176) and eastern end of town (different exit), as far as exit 180 east of Vail, is a dull red sedimentary sandstone and conglomerate inter-layered with dark red shale. Their exact age is a mystery; they contain no fossils by which they can be dated. But they are called Pennsylvanian-Permian because they are sandwiched between Lower Pennsylvanian and Triassic rocks. The red rocks are underlain by Pennsylvanian brown and gray sandstone and shale, well exposed between Miles 172 and 193. The shale layers are weak, and tend to move easily, especially when they are soaking wet. So they offer new challenges to highway engineers. The bumps in I-70 near Vail are due to the tendency of these rocks to slump and slide. They also hang dangerously steeply above the Vail ski resort. At exit 180, where we photographed V. palustris var. …., V. adunca, V. praemorsa, the Pennsylvanian-Permian sandstone is replaced by Precambrian granite. Cottonwood Canyon, west of Buena Vista, south of Mt. Yale, Sawatch Range, at 9,900 ft, photo of V. adunca in fall with yellow leaves. Glacial canyons. On Tertiary intrusion or Precambrian Gneiss & Schist. Can’t remember exact place where photo was taken. Scott, R.W., The Alpine Flora of the Rocky Mountains, Vol. 1, The Middle Rockies, 1996: Glabrous to puberulent, perennial herb with slender, short to elongate rhizomes. Plants appearing acaulescent early in the season, later developing prostrate to ascending, leafy aerial stems. Leaves alternate, with linear to lanceolate, toothed stipules, the blades ovate to broadly cordate, crenulate; peduncles shorter than to longer than the blades [but doesn’t say whether glabrous or very pubescent!!]. Petals blue to purple, often whitish at the base, with purple veins; lateral petals bearded; spur prominent, about half as long as the petals. Style slender bearded. Occasional to common in moist to wet meadows, willow thickets, and along stream banks in most major ranges of the Middle Rocky Mountains. Not yet known from above timberline in the Absaroka, Gros Ventre, Hoback, and Wyoming Ranges, Wyoming; British Columbia south to California and Colorado, and east to the Atlantic Coast. Hultén E., Flora of Alaska and Neighboring Territories, Stanford University Press, California, 1968: Stems from slender rootstock; leaves cordate, ovate, obtuse, finely crenate, often more or less brown-dotted, pubescent, especially on margins and on veins below, or nearly completely glabrous; stipules linear-lanceolate, mostly with long, glandular-tipped teeth; sepals lance-linear; petals violet or bluish-violet, often whitish at base, the lateral pair white-bearded; spur slender, obtuse, often hooked; cleistogamous flowers occur. Dry meadows, woods. Described from the northwest coast of North America. Circumpolar map gives range of V. adunca in a broad sense, including V. labradorica Schrank. [Good illustration on p. 682]. The population of ‘V. adunca’ that I saw in NE Utah, Logan Canyon, was atypical of all the other populations I have seen, from the Olympic Peninsula, California east from SFO to Lake Tahoe (with V. bakeri), SW Wyoming, Oregon etc. Also the form from Vancouver Island was atypical in its flower colouring. One colony in the Olympic Mountains was very pubescent which is also unusual. As usual, plants with a wide distribution are likely to show more variation. From Verna E. Pratt ‘Wildflowers along the Alaska Highway: Dry meadows and woods in British Columbia, Alaska and in the Yukon Territory. Blooming May and early June. This is a very low, compact plant in the Spring. Stems elongate later in the season. Niehaus, T.F., Ripper, C.L., & Savage, V., A Field Guide to Southwestern and Texas Wildflowers (Roger Tory Peterson Field Guides), 1984.: Long, erect stems. Rounded to heart-shaped leaves with lance-like stipules just below the petiole base. Flowers deep to pale violet. 2-20 cm. Pine forests. Northern SW, Rocky Mountains. Flowers June-July. Russ Jolley: 3-6”, meadows and open forests, generally at middle to high elevation in the west and middle Columbia River Gorge. Flowers early May: near the top of Hamilton Mountain Trail, and July: Chinidere Mountain. Verna Pratt, 2000: found throughout the northern portion of North America, but within Alaska it is only found in the Cook Inlet area. 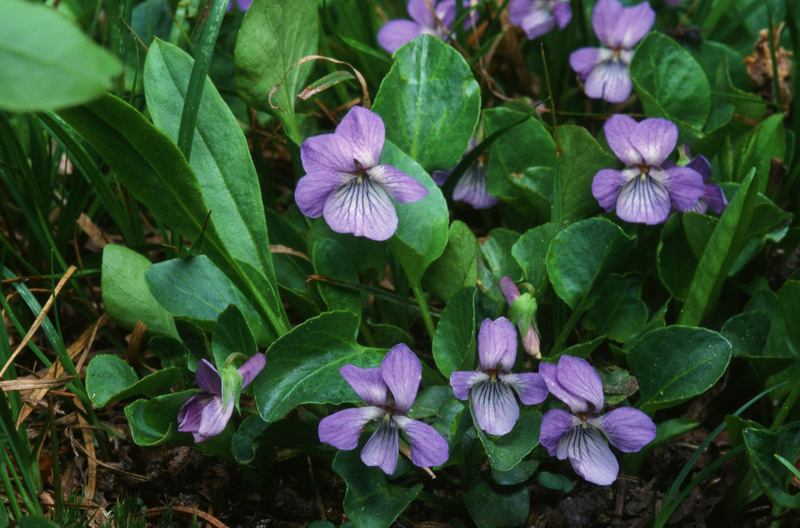 When found, it is usually abundant and waiting to be noticed with its clumps of numerous right purple blooms. Sunny rocky outcrops are its favoured place to grow. 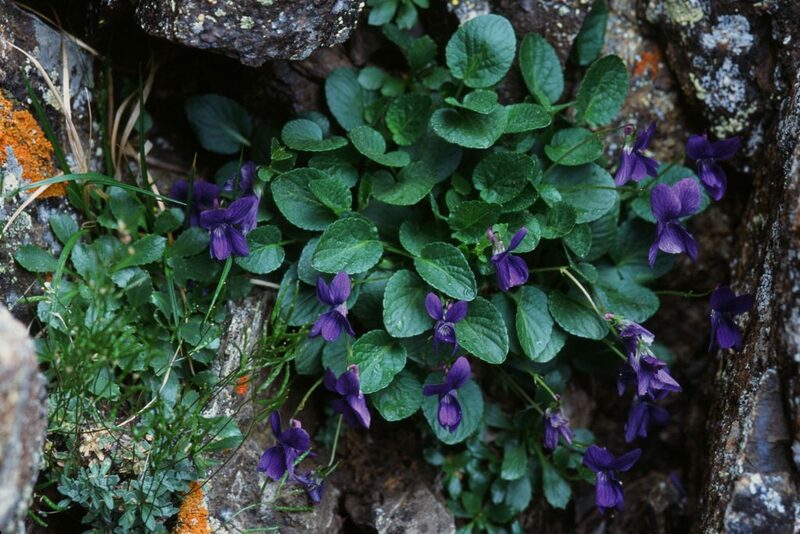 Atlas of the Flora of the Great Plains: Viola adunca recorded from the northern [Minnesota, North Dakota] and western edges [Montana, Wyoming and Colorado] of the Great Plains, and in the NW [western edge of South Dakota]. The distribution is only in the colder areas, and its distribution is limited by higher temperatures and lack of moisture. V. adunca. Canada: Alberta, British Columbia, Manitoba, Mackenzie, NW Territories, Ontario, Quebec (Gaspé Mt., St. Pierre), Saskatchewan, Yukon Territory.